These trendy triangle knot earrings from Apples of Gold Jewelry offer a wonderful and stylish treat for your ears! Created in 14K white gold, which offers a stunning shine that will have you pairing it with your favorite outfits, these knot design earrings are unique and playful. The friction push back closure design on the backs of the excitingly designed earrings make putting the earrings in a simple task, and the measurements of the knots are 8mm each in size. 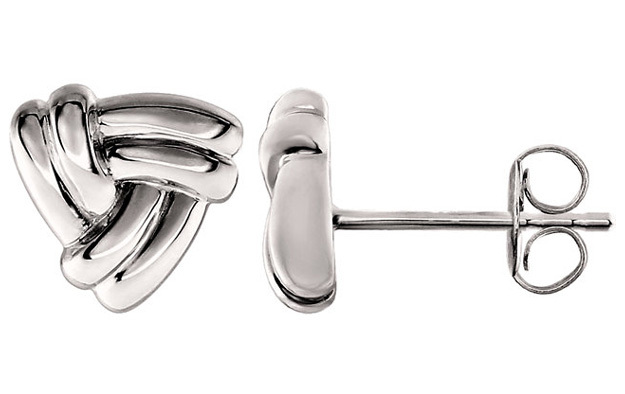 We guarantee our 14K White Gold Triangle Knot Earrings to be high quality, authentic jewelry, as described above.